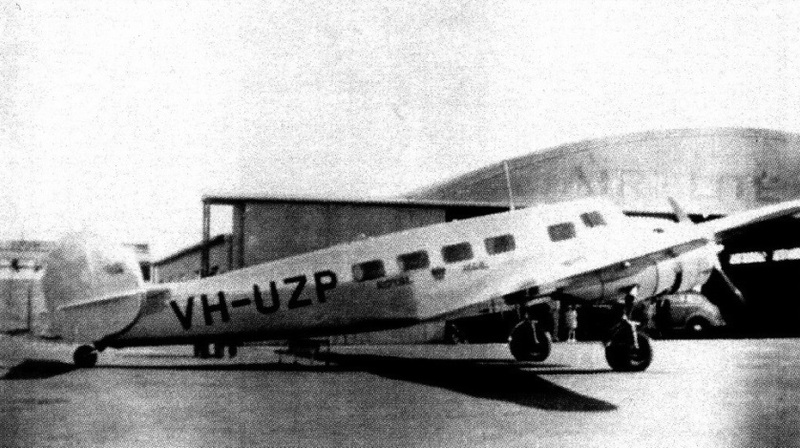 Lockheed Electra 10-B VH-UZP Ansalanta in benign repose awaiting her adventure with Neptune. 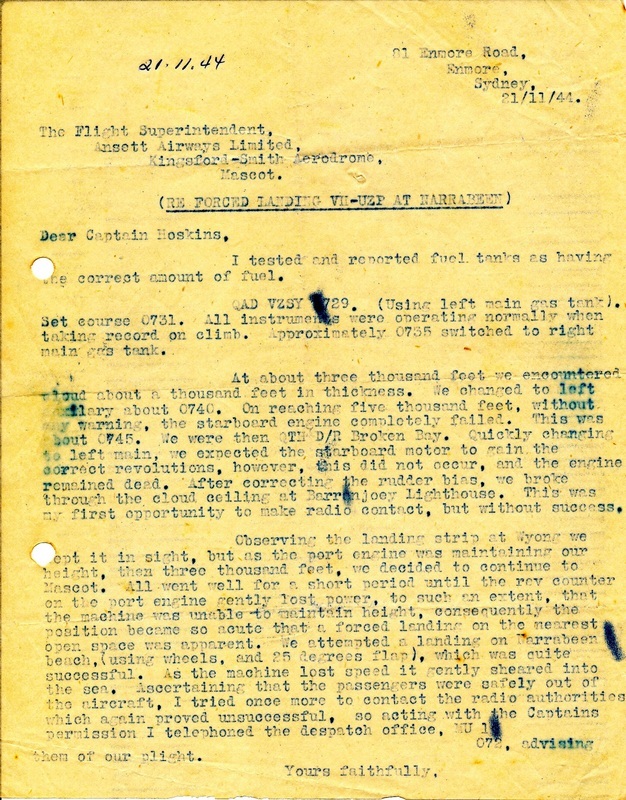 The Commonwealth Gazette of 1 June 1944 showed C. E. J. Eather 267720 commissioned on probation with the rank of Flying Officer in the Citizen's Air Force Reserve, attached to the General Duties Branch, Richmond Squadron. 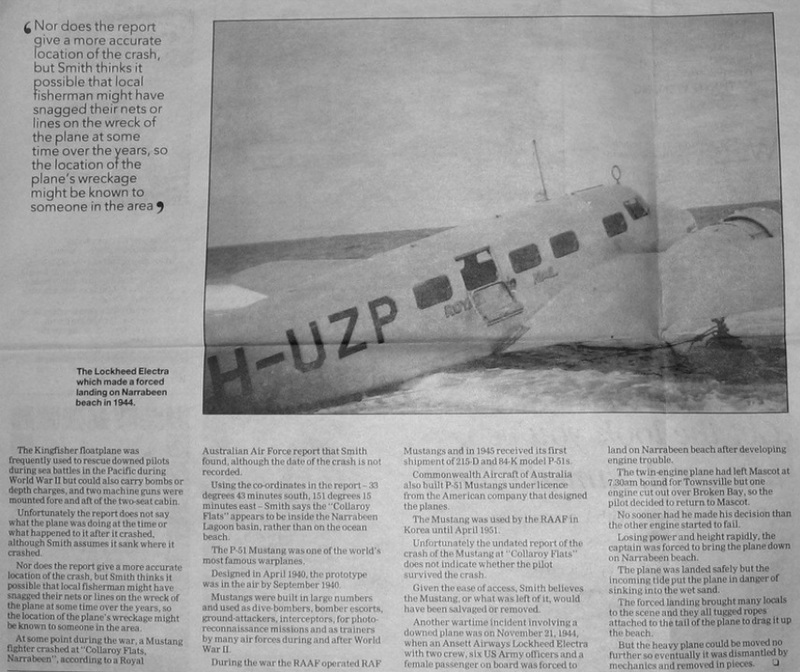 An incident that occurred on 21 November 1944 had overtones of sabotage and made the headlines of the day. However, like most unexpected adventures it began in a state of normality. I arrived at Mascot with an excited mind for my skipper was the great Harry Frank Broadbent, or Jimmy to his legion of friends. In this state I barely noticed the weather was stormy and blowing a gale, and his natural ease had me working as though we were a long time team. With loaded plane we left the blocks spot on schedule at 2 a.m. A short taxi brought us to the take-off point, but from that moment things began to go wrong. Our ignition check found an earthed magneto that forced our return for maintenance. The ground engineer told us the delay would be about an hour. Jimmy grunted, chose a chair in the dispatch room, and went to sleep! Four hours later my skipper ordered wheels up as he rolled her onto the heading for our first technical stop at Archerfield, followed by Rockhampton enroute to Townsville. During the delay the storm front had cleared to sea and we could see a mosquito winking 100 miles away. The raucous take-off scream of VH-UZP's twin 450 HP Wasp Junior engines was reduced to climb. They purred like kittens as they hurled us into a sky so vividly blue that it tortured the eyes. 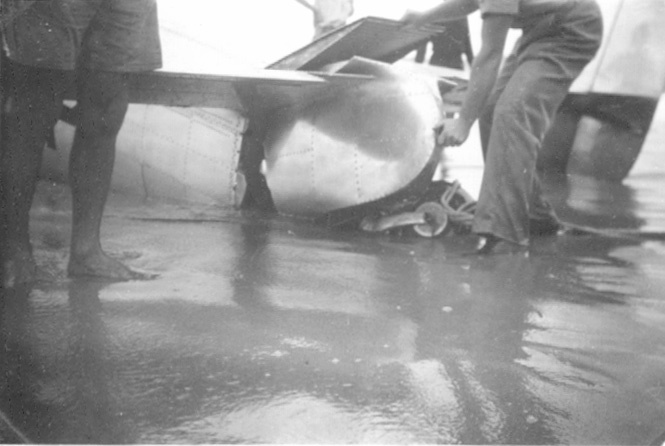 The altimeter had ticked past 5,000 feet when, without warning, the starboard engine spluttered and lost thrust. We were over Broken Bay at the mouth of the Hawkesbury River just north of Sydney. Jimmy applied full power to the other Wasp and turned back for Mascot. Other than a gradual loss of altitude to preserve control speed against the dead engine's drag, he had everything under control. My job was to monitor the radio and the port engine. Suddenly, it began to lose revs and the plane assumed the gliding angle of a rock! We could not stay in the air much longer. A slamming turn to port lined us up with Narrabeen Beach. A slight bump and Jimmy had put her down on the hard packed sand. As she lost way the slope of the beach caused her to slew gently to the left, stopping with the docile surf softly caressing her nose. Jimmy instructed me to get the passengers out, and in my excitement I nearly cut myself in two, slamming against my still firmly locked seat belt. I overcame this obstruction and then tried to strangle myself with the radio headset cord. Jimmy was in hysterics and told me I'd make a fortune on the boards in vaudeville. I left the flight deck with a troubled mind. Would I make a better comedian than a pilot! Yet, this gracious man never mentioned my embarrassing antics again -naturally, neither did I! With no further impediments I had the rear door open in a flash, and standing in the surf helped the dazed Americans disembark. When I removed the Royal Mail canvas bags I had finished my duty. In a spirit of accomplishment I shrieked All Clear. With a solemn, Thank you mate, Jimmy came towards me, saw my grinning soggy condition and smiled sympathetically. 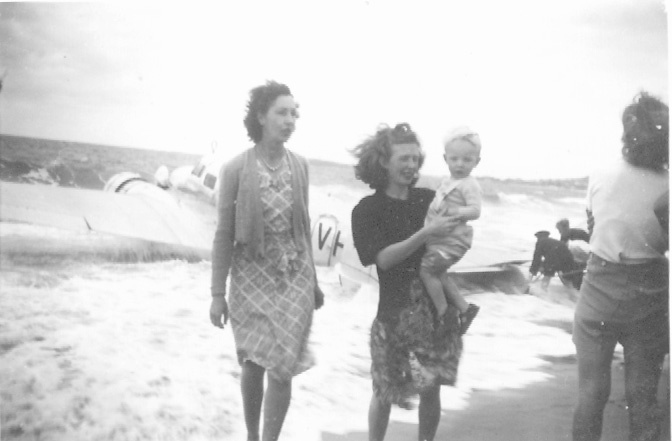 Then I learned a lesson in savoir faire that remained with me throughout my flying career. He turned, opened the wing exit window, sauntered the length of the wing and with regal splendour stepped onto the dry sand. The rising tide gradually had VH-UZP awash. In a frenzy of activity a tractor driver passed a heavy rope around the tail wheel and cone, and in his great enthusiasm tore off the tail. His good intentions caused the only structural damage to our graceful plane. 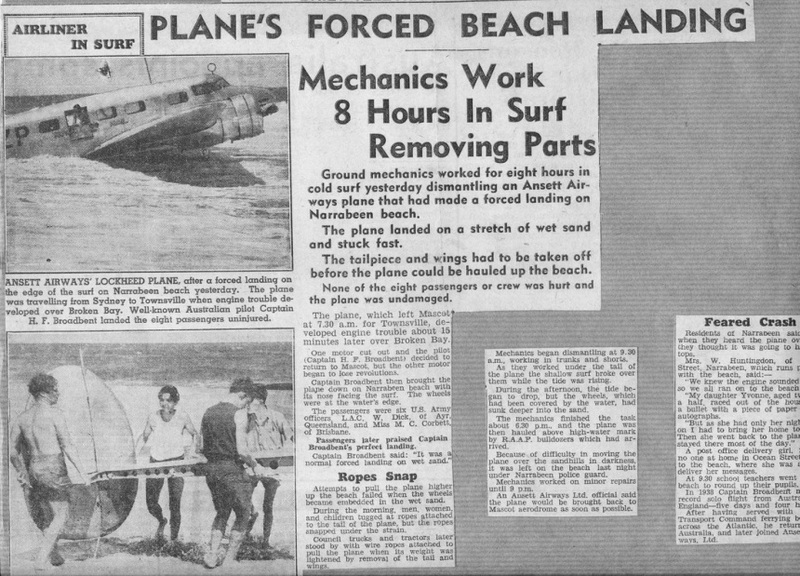 Some days later we learned that a mixture of sugar and sand was found in the engines. 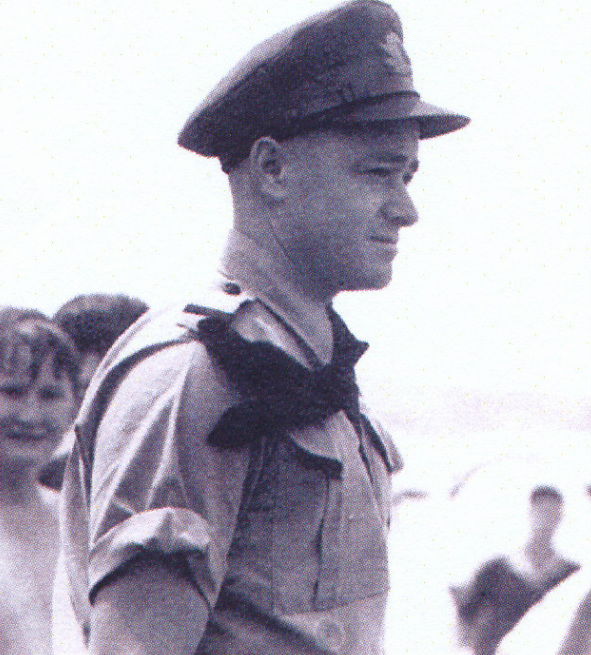 Most likely sabotage, as aboard were several of General Douglas MacArthur's staff. 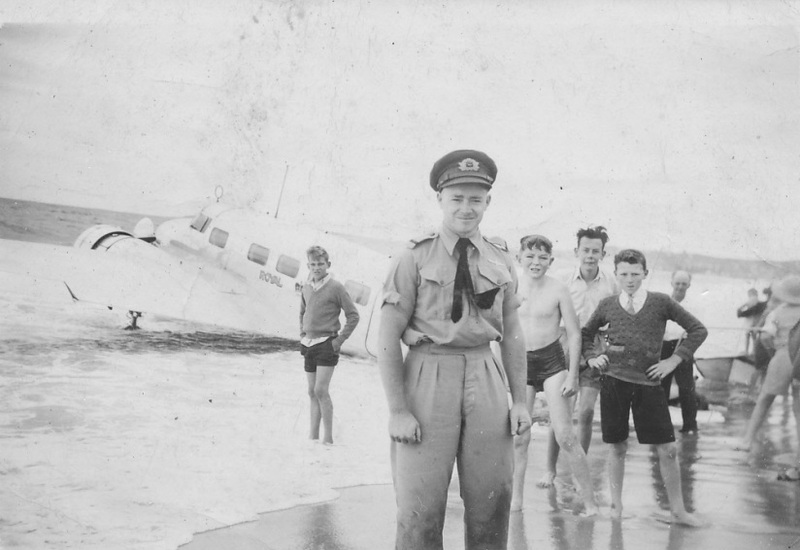 First Officer Charles "Chic" Eather just after the forced landing at Narrabeen Beach. 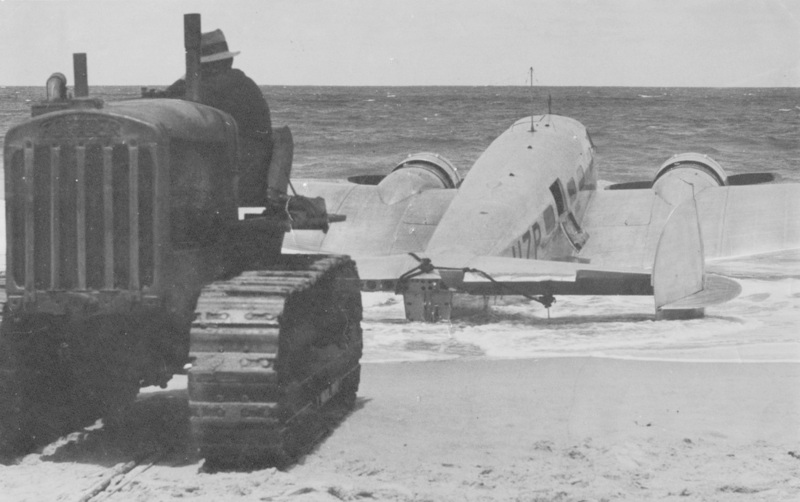 Workman helping to recover downed aircraft. Nancy Ellis and friends lending moral support to the recovery effort. 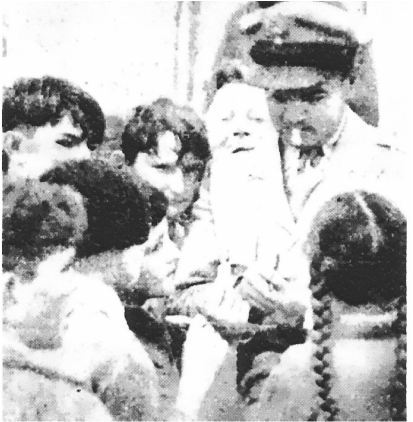 American serviceman, passenger from the stricken aircraft, signing autographs for the multitude. 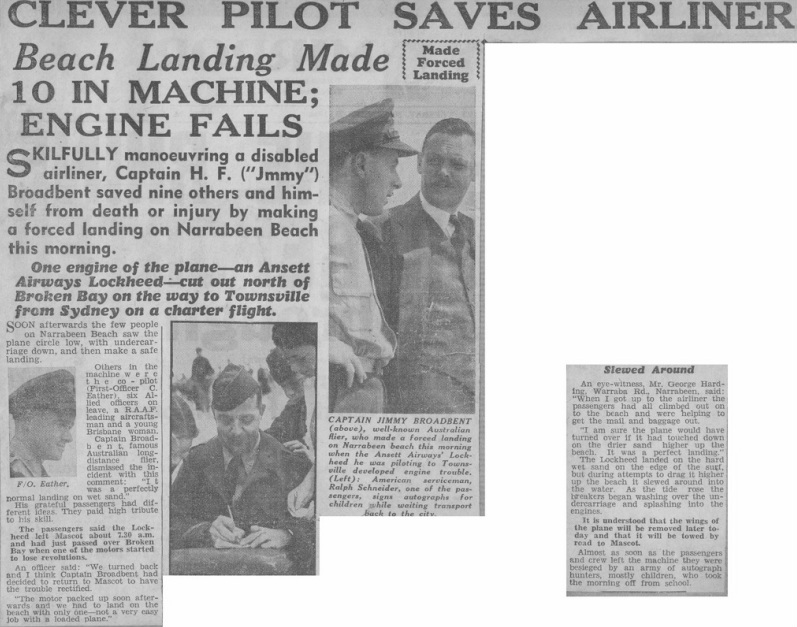 The Sun newspaper clip of the forced landing. N.B. the little dog in the foreground. 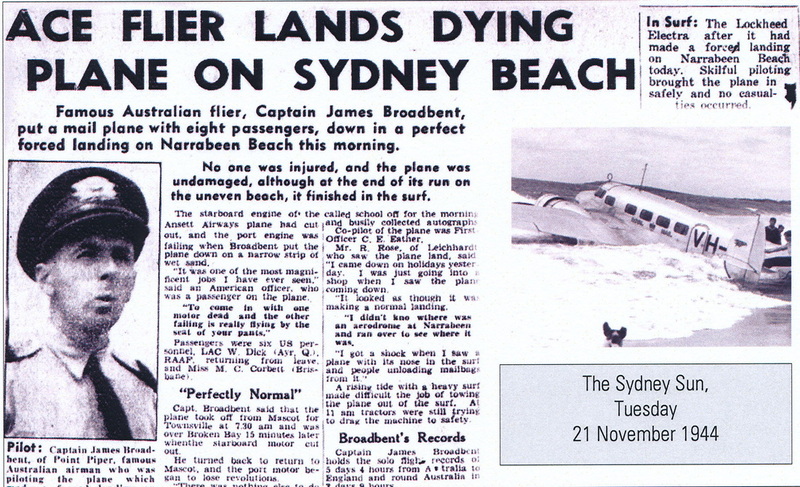 A newspaper clipping at the time of the Narrabeen Beach forced landing. 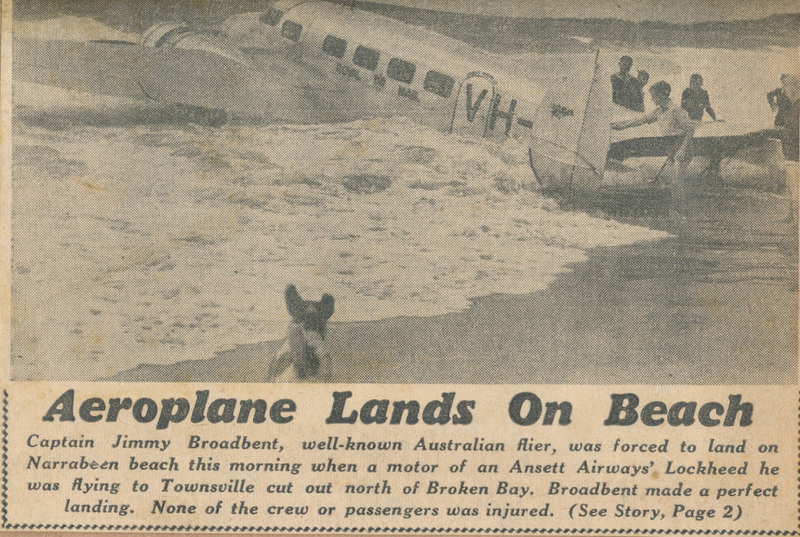 Another press clipping of the Narrabeen landing. For more details about Jimmy Broadbent click on the image at right.